As touchscreen smartphones and tablets are continuing to rise in popularity, so are Tablet kiosks. With a Tablet kiosk, you can greatly enhance the experience of your clients and customers, who can easily access information and customize their purchase with the touch of their fingertip. Businesses across all industries can benefit from Tablet kiosks, including hotels, restaurants, transportation companies, retailers, offices, and museums. Regardless of the size of your company, Tablet kiosks are an innovative and cost-effective solution for expanding your business and interacting with consumers. While this type of solution was very expensive in the past, its increased popularity has made these touchscreen kiosks much more affordable. While the possibilities for these kiosks are endless, their primary benefit is that they give customers the information and resources they need, without making them wait in line to talk to a company representative. If a representative is unavailable, customers can easily find the information they’re looking for, and more, from the kiosk. Likewise, they allow employees to focus more of their time on other responsibilities. · Versatility – Tablet kiosks are extremely lightweight and versatile, so you can move them anywhere and use them for essentially any purpose. With a Tablet kiosk, job prospects can fill out a digital job application; employees can perform training courses; and customers can view inventory, provide product feedback and customize their orders. You can even bring them along to events and trade shows to increase the visibility of your brand. · Increased brand awareness – Your kiosks can be customized to include your company colors and logo for increased brand awareness and marketing. · More efficient management – With their mobile device management system, you can manage all your kiosks from a single centralized location. · Reduced overheads – A Tablet kiosk can provide its users will important information about your business’s products and services. They can relay accurate information to your customers and eliminate the need for additional sales staff. If you want to streamline your business operations and improve customer satisfaction, then choose a Tablet kiosk from RedyRef, a leading manufacturer of high quality interactive touchscreen kiosks. We have been producing self-service kiosks and interactive software for over 100 years. Our kiosks combine the Android or Mac OS software and our own exclusive programs, to create a kiosk that’s tailored to your specific needs. 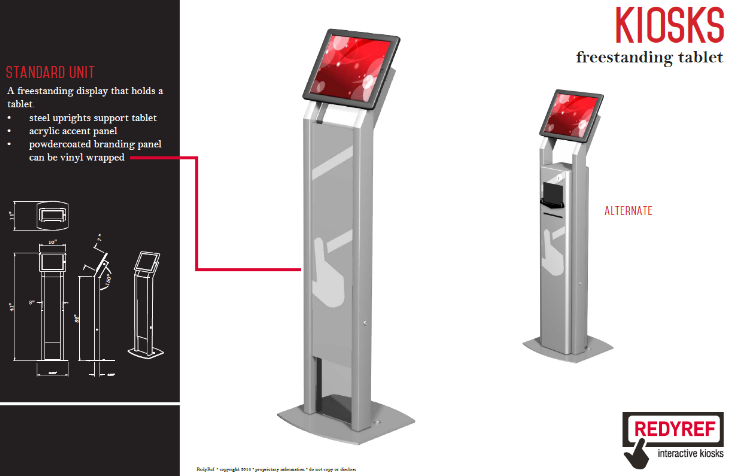 For more information about our Tablet kiosks, visit us online.